I visited J Lohr ages ago, wide-eyed and somewhat new to California wine (I studied wine in Europe first then learned domestic grogs). The tour was lengthy, the hospitality warm and the wine impressive. I don’t remember a Rhône program there but that’s because it wasn’t until a few years later that they started down that road. A nice journey it has been. 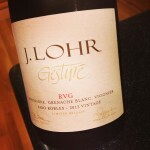 I lean more towards their Rhône whites — Roussanne, Marsanne, Viognier — than their reds. The Syrahs are over-oaked for my palate but some people love that. One of the funny, ironic tidbits about Kim Crawford wines is that they aren’t produced by or owned by a female like many believe. The winery was founded by a super cool guy named Kim but he sold his eponymous wine brand over ten years ago (read about the history here). Quality suffered for a few years, especially after Winemaker Jules Taylor left in 2008, but current winemaker Anthony Walkenhorst appears firmly back on track with this 2013 Pinot Gris from the cool, green grassy lands of New Zealand. Up the road from where I live in California is a winery that continues to impress, vintage after vintage: Dry Creek Vineyard. I did a search on my website and I’ve written about them seven times in the past eight years. That’s a lot, considering the number of wineries on this earth I could be writing about. But I keep going back to them simply because their value remains outstanding. Family-owned and -operated, Dry Creek Vineyard was founded in 1972. Founder David Stare bravely hung his hat on California Sauvignon Blanc and Chenin Blanc — a not-so-glamorous grape originally from the Loire Valley (more about Chenin Blanc) — early on and embraced both grape varieties with a burly bear hug. At the time, other wineries in the area looked at him kinda funny but he soldiered on. David, a graduate of MIT, worked for railroads before he founded the winery in Dry Creek — where the winery stand today was nothing but plum (or “prunes”) orchards. Forty-two years later, the family owns 185 acres of grapevines and his daughter, Kim, heads up the company as President. Sweet wines are everywhere. Previously eschewed for fear of being snubbed by snobs, wineries now proudly tout their full-frontal sugar on their labels. Consumers who love dessert for their appetizer should be in high heaven. Leading the pack is Moscato, whose popularity has shot up like blood sugar after a glass of it. But, sadly, most Moscatos lack balance. When I first started drinking wine in Europe, Swiss-grown Muscat (as it is called in French) tantalized my palate with sweetness and acidity. I reveled in its dry finish after my tongue feasted on a fruit salad of apricots, peaches and juicy, red apple. I had not experienced this same sensation in a wine until recently in Franciscan’s 2012 Equilibrium from Napa. Many people bemoan the cost of drinking juice hailing from the great granddaddy of wine regions, France. Yes, Bordeaux and Burgundy reign as the pièce de résistance of vin from this country but when you pull your almost empty wallet out of these collectors’ areas many bargains can be grabbed. Take the Touraine region, for instance. Nestled in the Loire Valley, southeast of Paris, the Touraine sub-region is better known for its Chenin Blanc (Vouvray). 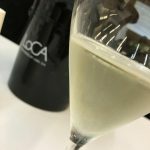 But while Vouvray certainly satisfies part of the French white craving, I’ve recently turned my sights on the region’s other, crisper white varietal: Sauvignon Blanc. Sauvignon Blanc, New Zealand’s white wine darling, was born in France’s Bordeaux region. But New Zealand put this grape on the American map, no matter what people say. And Matua Valley figured out how to bottle the New Zealand Sauv Blanc essence for less than $10. Impressive. This wine isn’t going to shock you or deliver anything super innovative. But it’s one helluva summer pool wine for the money (screwcap too). It is, by definition, the typical NZSB: tart grapefruit, lime rind, zippy acidity and loads of citrus. It has a refreshing fizziness on the tongue and a long, clean finish. Despite the hefty acids, it drinks pretty smooth, especially for a wine in this price range.